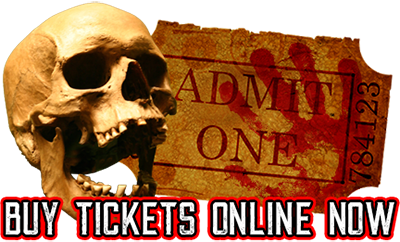 Dead Man's Farm Haunted Attraction is located at 9567 US-11E, Lenoir City, TN 37772 - Just 2 min from Farragut and West Knoxville! This is a physical location only. NO mail will be received here. PLEASE HELP US KEEP PARKING FREE BY CARPOOLING! NO OVERSIZED TRUCKS/VEHICLES! PARKING SPACE IS LIMITED! Spending the night? Guests visiting Dead Man's Farm, receive 10% off your hotel accommodations at the Hampton Inn Lenoir City. Located only 2.0 miles away, this is the closest hotel to the haunted house. Call Hampton Inn Lenoir City at 1-865-988-2000 and let the operator know that you are visiting Dead Man's Farm to receive your 10% discount. ​*​Rooms limited to availability. Get Exclusive Offers & Discount Tickets!